I often get asked how to turn on the automatic Out of Office messages in Outlook, so I decided to make a quick post about it. 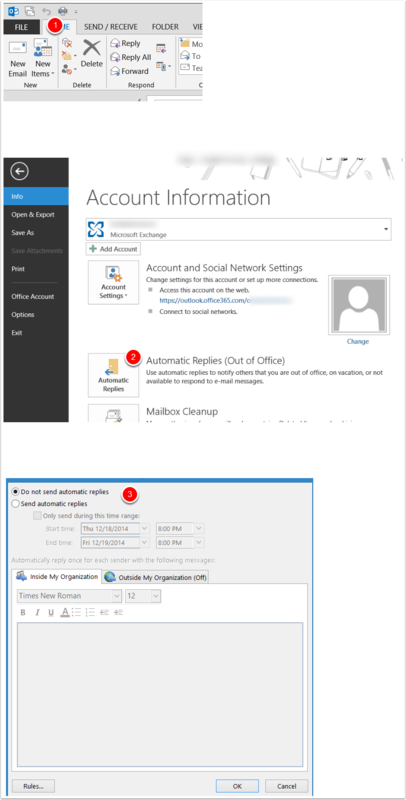 The way it is done varies depending on what version of Office / Outlook you are running, and if you are connected to Office 365 or Exchange. Initially I’m only going to cover Outlook 2013 connected to an Office 365 account. If you want other instructions please let me know and I’ll put something together. Fill in the information for your out off office messge. Please note that you can have different replies sent to people internal to your organization vs. those external to your organization.